Designer Milton Reeves rejected the general consensus that automobiles only needed four wheels, feeling that six or eight wheels was a better idea. 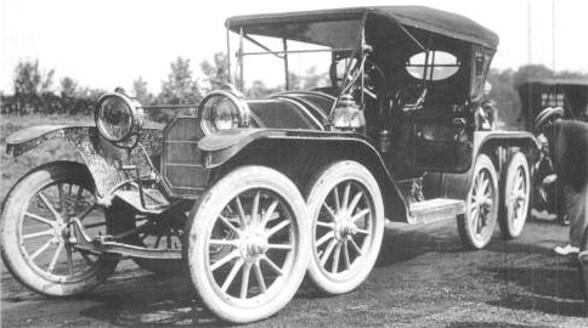 Under the auspice that more wheels would equate to a smoother ride, Reeves began modifying a 1910 Overland. Welding in some parts, adding two more axles and four more guncart-style wheels, Reeves gave birth to the OctoAuto. He displayed the Frankenstein monster of a car proudly at the Indianapolis 500. The OctoAuto measured over 20ft long. Zero orders for this hideous vehicle were made, but Reeves didn’t let that stop him. The following year he tried again with the Sextauto, which was a six wheel, single axle design. As evidenced by the lack of six wheels on normal cars today, the Sextauto was also a flop.